Welcome back to another one of our Remerge recaps, a monthly roundup of current news from the world of mobile marketing. This series will bring you up to date on all the latest launches and trends happening within Remerge, and the ever-changing mobile industry to help you to maintain an effective mobile retention strategy. March was another busy month for everyone at Remerge throughout our global offices, and saw us host our first event in Tokyo alongside our friends at adjust. March was also a hectic month for the mobile marketing industry with some major product launches and insightful reports projecting the growth of the industry over the next year. 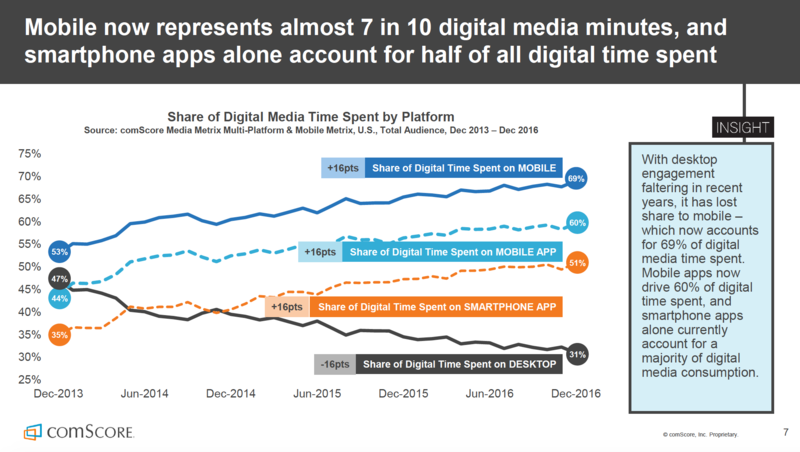 In a new report from comScore titled “2017 US Cross-Platform Future in Focus”, the measurement company revealed that mobile now accounts for almost 70% of time spent with digital media, with smartphone apps accounting for 51% of all digital media time. The report detailed the effectiveness of advertising on mobile due to less cluttered screens and smarter ads that appear closer to the point of purchase in the user experience. However, the report also concluded that while mobile ad spend continues to grow, more than 80% of ad dollars in the retail category still go towards desktop despite just 33% of consumer shopping time being spent there. While the opportunity to create memorable and engaging experiences between brands and customers has become abundantly clear to marketers, many are still struggling to measure ROI and to place mobile within the larger context of their overall digital marketing efforts. Mobile usage is set to rise even more in the next 2-3 years thanks to the availability of cheaper smartphones and bigger screens and is being led by the newly developed ‘mobile only’ audience of users who browse social media, complete transactions and play games exclusively on their smartphones. 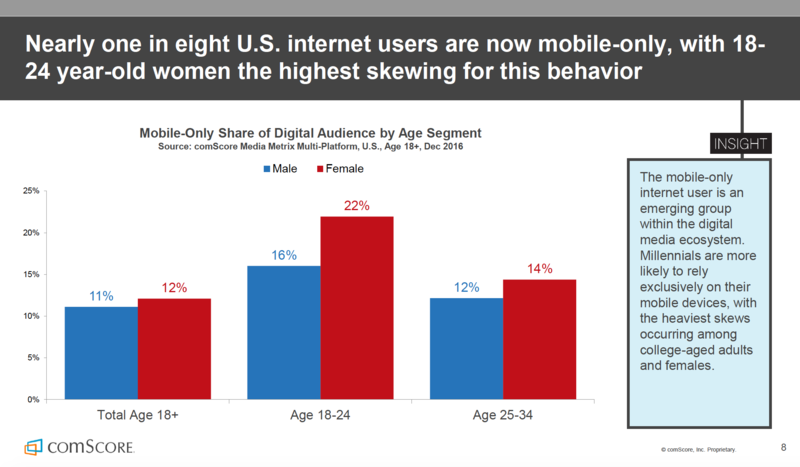 The report also revealed that nearly one in eight U.S. internet users are now mobile-only, with 18-24 year-old women the highest skewing for this behavior. This month we celebrated International Women’s Day - a day that celebrates the social, economic, cultural and political achievements of women. This year’s theme was “Be Bold for Change” and saw some of the biggest names in tech announce brave new initiatives that will fight actively for gender equality and equal pay in the workplace, something the World Economic Forum says will not happen until 2186. Working in the relatively young mobile industry, it’s not at all unusual for women to hold c-level positions and each day we meet new app businesses with strong, independent women at the helm. Despite being heavily represented in the workforce of the mobile industry, there is still a long way to go to achieve gender equality. 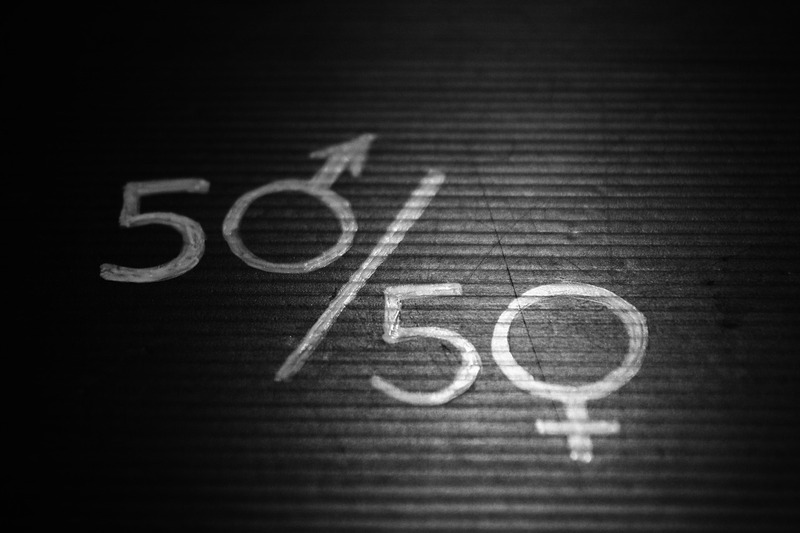 The disparity in gender representation is always clear to us at marketing and tech conferences we attend, and as a growing tech company; we know that we must do our part to strive for equal rights in the workplace. We’re lucky to have many inspiring women on our team working to help build our company and drive the growth of our clients’ app businesses and we will continue encouraging women to pursue careers in tech. 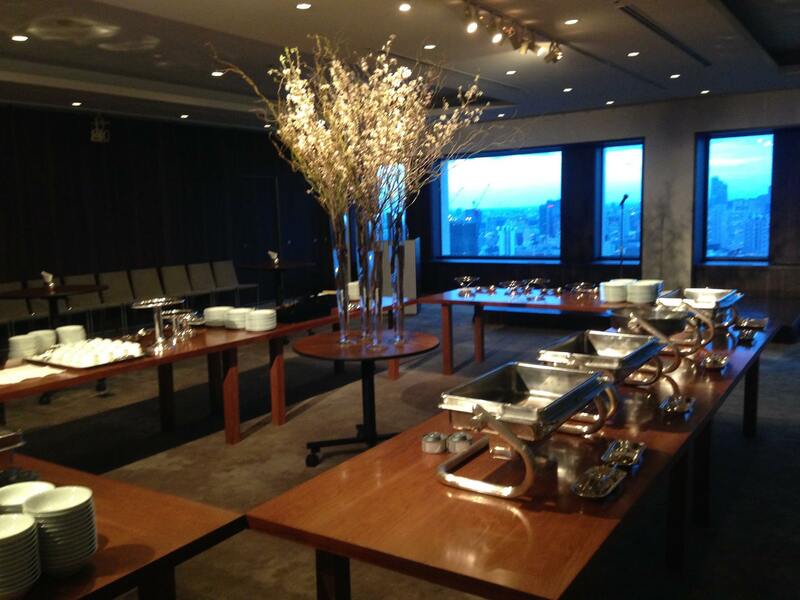 March saw us host our first event in Tokyo after opening our office there this year. We co-hosted with our partners at adjust for a wonderful evening of intimate networking at a spectacular location. It was great to have some of our Berlin team there for the event to welcome our guests and learn more about their business and how app retargeting could help them to achieve their retention goals. Japan is a really exciting market for us and we are delighted to be growing our team to help service our Japanese clients, and to introduce our solution to new clients looking to engage their app audience. We hope to host more events in the coming months and look forward to growing our presence in the region in the year ahead. 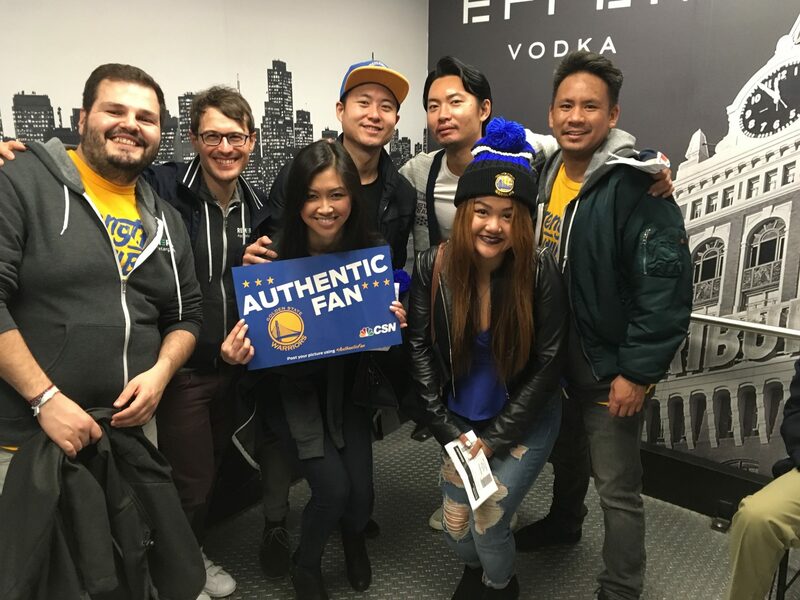 Over in San Fran, we welcomed some of the biggest names in mobile marketing to join us at Oracle Arena for a night of basketball fun. The atmosphere was electric thanks to a great game and even greater company! As we grow, it means a lot to us to have our clients join us to celebrate our successful collaborations. Over the next few months, we will be hosting our anniversary parties with some events in Berlin and San Francisco and hope that some of you will join us as we look back on the past Three Years of Remerge. You can get a ticket to our Berlin anniversary party by clicking here. Check back in over the next few weeks to read some inspiring stories of our team and how they have grown within the company. We’ll also be talking about an exciting new product launch that we’ve been working on that will expand our client’s advertising options even more.